IoT tech will prove pivotal in world-record-breaking race around Ireland. 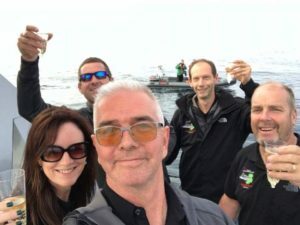 A world-record attempt by Cork speedboat Thunder Child in the coming days* will be an exemplar for internet of things (IoT) technologies developed by a number of Irish start-ups. Safehaven Marine’s world-record attempt involves circumnavigating the entire island of Ireland, taking in another island on the way, Rockall, which lies almost 500km north-west of Ireland. This exact route has never been attempted before, therefore, no such record exists. The venture is now fully sanctioned by the Union Internationale Motonautique (UIM). The speedboat will feature live tracking via IoT and satellite devices, using SafeTrx Open Architecture created by 8 West Consulting, an Irish company that was spun out of DeCare Systems last year. It will also feature Sigfox connectivity to the VT Networks all-Ireland network, using signals from HidnSeek trackers co-founded by former Intel Leixlip engineer Xavier Torres-Tuset and Stephane Driussi. The project will see the introduction of a new SafeTrx-compatible, wearable distress device that is similar to a dive watch. It is fully integrated with SafeTrx technology to transmit emergency alerts should the user experience distress at sea. The devices are being manufactured by a Norwegian partner. 8 West has also integrated a man overboard (MOB) Bluetooth LE wearable with Dutch partner PanPan. This allows for automated alert integration from the PanPan device into the SafeTrx ecosystem. In ‘Search’, it has introduced autonomous drone dispatch with SafeTrx through Donegal-based partner DroneSAR, to accelerate the SAR process. In ‘Respond’, there is integration with Dublin company D4H’s live emergency operations platform. “Our new SafeTrx Open Architecture has allowed us to build a scalable platform to accommodate new, non-mobile tracking and alerting technology,” explained John Murphy, CEO of 8 West. “Working with these new, low-cost, long-range, long-battery-life IoT devices and new IoT distress wearables provides our customers with new possibilities. We saw the prospect of partnering up with Safehaven Marine as a fantastic opportunity to test these new tracking and alerting devices in one of the harshest environments on the planet: the North Atlantic. “Our devices on the Thunder Child will be transmitting location data over L band, Iridium, GSM and Sigfox. All these are integrated into SafeTrx and are accessible to the public on the dedicated SafeTrx Thunder Child tracking website,” Murphy said. The Sigfox component will connect to the all-Ireland network developed by VT Networks, which is expected to extend at least 150km out to sea. Sigfox is a low-power, wide-area network designed to allow simple IoT devices to communicate. “Sigfox has strong over-water performance, and we believe it has important applications in marine tracking and safety,” explained VT Networks CEO Mark Bannon. Xavier Torres-Tuset explained to Siliconrepublic.com that the mission around Ireland is also going to be a proving ground for ultra-narrowband, long-range communications. “At HidnSeek, we love pushing boundaries, after world-record distance transmission at 1,151km between Lisbon and Gran Canaria, and world-record transmission in high-altitude balloon over 32.5km (a near-space mission). “Beyond those world records, we want to showcase what ultra-narrowband, long-range communication radio can do with ultra-low-power envelope. Boat festooned with the cream of Irish IoT technology completes journey in 34 hours, one minute and 47 seconds. 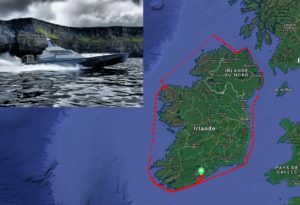 Cork speedboat Thunder Child, which circumnavigated Ireland by taking the long way round via Rockall Island, returned safely to Cobh last night (5 July’17) after establishing a world record for the feat. 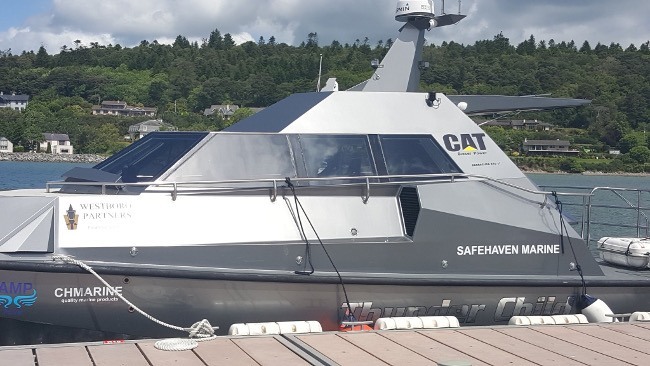 Built by Safehaven Marine in Cork, Thunder Child is a 17-metre, high-speed, wave-piercing, low-radar cross-section interceptor. It is designed for naval, law enforcement and offshore patrol applications, and is also capable of high-speed, search-and-rescue (SAR) operations; being self-righting and offering fast, emergency-response times. The exact route, taking in Rockall, which lies 500km north-west of Ireland, was never attempted before and therefore no such previous record exists. The entire venture was sanctioned by he Union Internationale Motonautique (UIM). The boat stopped twice for fuelling at Portrush in Northern Ireland and at Broadhaven in northwest Mayo. The boat travelled at an average speed of 32 knots and achieved a top speed of 52 knots while making the journey. It featured Sigfox connectivity to the VT Networks all-Ireland network, using signals from HidnSeek trackers co-founded by former Intel Leixlip engineer Xavier Torres-Tuset and Stephane Driussi. This trial was a perfect showcase of Third Party Integration with HidnSeek’s open API’s. It was very easy for 8 West Consulting to add HidnSeek’s trackers to their platform and to benefit from our geolocalisation services using VTNetwork, Sigfox connectivity this will open-up undoubtedly new opportunities.